When Tapizar won last weekend's Sham Stakes (gr. III, video) in easy, front-running style, he became the newest graded stakes winner to emerge from the successful breeding program developed by late Verne Winchell. Winchell's son Ron races Tapizar under the Winchell Thoroughbreds LLC banner, the same group that campaigned that colt's sire, Wood Memorial (gr. I, video) winner Tapit (TrueNicks,SRO). In 1981, Verne Winchell claimed a speedy filly named Carols Christmas for $25,000 from a six-furlong race at Santa Anita. Winchell liked her pedigree, but as he later recalled, her conformation was questionable. "She had a pretty bad swayback," Winchell said in 1990. "I was concerned that she might pass it on to her offspring, but she never has. Her foals have all been quite good-looking." All, that is, with the exception of her first foal, a filly by 1979 Santa Anita Derby winner Flying Paster. Winchell sold that filly as a yearling for just $4,500, and she never raced. Less than a year later, Winchell offered Carols Christmas at Keeneland January in foal to his stallion Classic Go Go, but the mare failed to meet a meager $8,000 reserve price. Undaunted, Winchell brought her home and watched Carols Christmas develop into a foundation broodmare. Carols Christmas would produce three stakes winners, including the fleet grade I winner Olympio and Del Mar Debutante (gr. II) winner Call Now. Through her daughters, Carols Christmas is ancestress of graded winners Cuvee (TrueNicks,SRO), Early Flyer (TrueNicks,SRO), Fun House, Paddy O'Prado, Pyro, War Echo, Wild Wonder, and Will He Shine (TrueNicks,SRO). And remember that $4,500 Flying Paster filly? Later named Dana Nicole, she became the dam of WinStar Galaxy (gr. II) winner Bien Nicole, earner of over $1 million. Pulpit (TrueNicks,SRO) and sons have been good with Deputy Minister mares. There are three stakes winners and a grade II-placed horse from 26 starters on the cross, producing a B+ TrueNicks rating. Note that the best horses on the cross are 8.5-furlong types. Thiskyhasnolimit has done his best running at that distance, placing in the Iowa Derby (gr. III) and Indiana Derby (gr. II) after winning the one-mile Iroquois Stakes (gr. III) as a two-year-old. Fly Borboleta won an allowance a nine furlongs, but gave her best performance when second in the 8.5-furlong Louisville Breeders' Cup Handicap (gr. II). With Tapizar now on the Kentucky Derby trail, remember that Tapit himself started in the 2004 Derby (video) won by Smarty Jones. Tapit made a big move on the far turn, but may have been compromised by the sloppy conditions as he could only manage a ninth-place finish. Tapizar broke his maiden on a fast track at Churchill Downs, winning by 10 lengths (video). Tapit's best runners have excelled at or slightly beyond one mile, but, of course, his Careless Jewel romped in the 10-furlong Alabama (gr. I) and Testa Matta won the Japan Dirt Derby at the same distance. 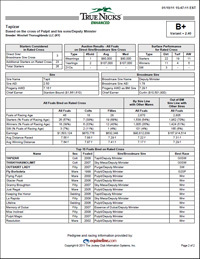 As you can see in the TrueNicks Enhanced report below, colts on Tapizar's cross have a greater average winning distance than either sire or broodmare sire, so the combination at least suggests a preference for a bit more ground than average. Given his sprinter/miler-oriented female family and front-running style, Tapizar certainly has some questions to answer in his upcoming Derby preps. That being said, his pedigree is in line with Kentucky Derby winners of the past decade, and it would be no great surprise to see this colt get the 10 furlongs on the first Saturday in May. 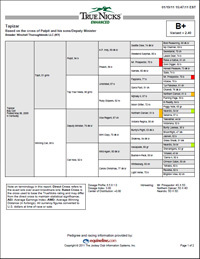 Click here to view the TrueNicks Enhanced report for Tapizar.